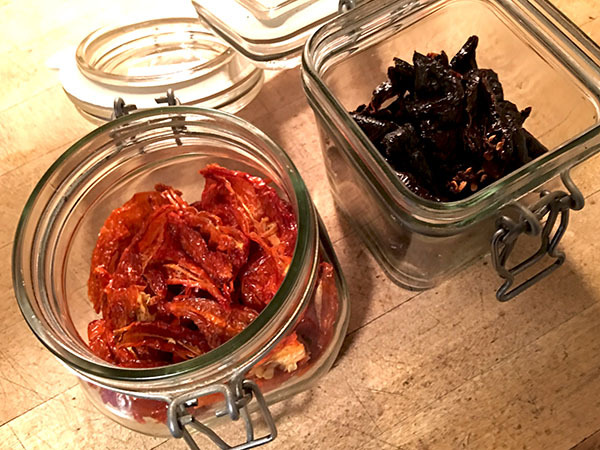 I’ve used and written about these peppers so often, both fresh, as seen above, when they were available last summer, and now home-dried, that I decided I had to do a special post about them alone, if only to have something to link to. The Habanada is a highbred pepper which was developed only recently; I think it it’s a very special one. 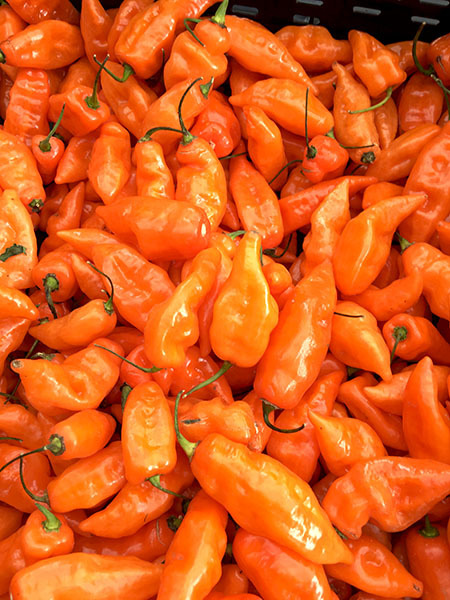 Habanada is a brand new pepper, the first truly heatless habanero (hence the haba-nada) bursting with all the bright, tropical flavor of the fruit unmasked. Many attempts have been made over the years but none have achieved the fullness of flavor with absolutely zero heat. Their crisp, thin skin has an exotic, floral flavor like no pepper I have ever tasted. From cast-away seed to a signature show-stopper variety, Michael Mazourek has brought this pepper a long way in just thirteen generations. I’ve encountered Habanadas only at Norwich Meadows Farm, in the Union Square Greenmarket. I retrieved the darker, very serious looking mahogany-colored batch from the oven just in time; they have more than a hint of smokiness (and, oddly something like an anise scent), in addition to the elements they retain from the original Habanero. The golden orange ones, which were my second try, are somehow both more gentle and more powerfully aromatic; they’re quite perfect, in every way. All three versions have been wonderful additions to many parts of many meals over the last 6 or 8 months. 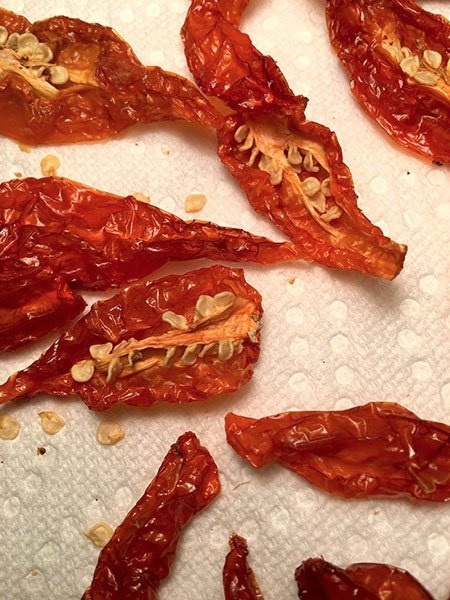 I miss the fresh peppers, but I’ve been using both the darker and the lighter versions more than frequently ever since I dried them last fall, as a quick search will show. They work with everything, meat, fish, eggs, pasta, vegetables. The only difficulty they present, I might confess, is controlling my addiction (and deciding which of the 2 to use in any particular application).